Snow days and baking - they just go together. Last week we had what I hope will be our last snow storm of the year. It was a good one, too, with about 10 inches of light and fluffy snow. We played outside for a bit and when we came in, we got to work baking. I have made chocolate chip cookies in the past and have had success with some recipes and have had major failures. 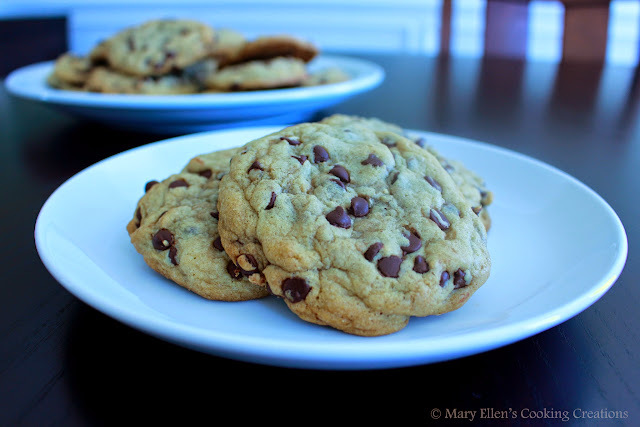 So before we went out to play, I searched for a really good chewy cookie recipe. I found one and after reading all of the amazing reviews I had to try it. My 4 year old had SO much fun making these - she did all of the measuring and formed the cookies. Now, my husband is VERY honest giving his feedback on things I make. He always does it in a constructive way, like saying that the dish could use more heat, more salt, more texture, etc. So when I popped one of these cookies in his mouth as he was going by the back door with the snowblower and he immediately raised his eyebrows in a "wow" way, I knew they were good. Later he said they were the best cookies I ever made. I agree! We ate a few right out of the oven and they were crispy on the outside and super gooey and chewy in the middle. Even better, once they cooled they stayed that way. This will definitely be my go-to chocolate chip cookie recipe. In a medium-sized bowl, whisk together the flour, baking soda, cornstarch, and salt. Set aside. In a large bowl, beat together the cooled melted butter and the sugars with a hand mixer (I used my Kitchen Aid on speed 2) for about one minute. Then, add in the eggs and vanilla extract. Beat until just combined. Slowly add in the dry ingredients and mix briefly, just until there are no flour clumps left. Fold in the chocolate chips. Cover and refrigerate the dough for 30 minutes to an hour. Remove the dough from the refrigerator and preheat the oven to 325 degrees, making sure you have the racks in the middle of the oven. Scoop ¼ cup of cookie dough at a time and roll into balls (I made mine just a bit smaller - they were still really big cookies!!!). Then, tear the balls in half by pulling gently on both sides. Smush the two halves together again, but this time have the lumpy, torn sides face upward. Place on a baking sheet lined with parchment paper, making sure the cookies have plenty of space to spread. Bake for about 12 minutes, rotating half-way through, or until the cookies have spread out and the edges are golden, but the center of the cookie still looks soft and just slightly under-cooked. Let cool on the baking sheets until the cookies are firm enough to remove. Note from author: Every oven is different, so I recommend starting with just one or two cookies on the tray to see what baking time works best for you! I baked the cookies for 13 minutes and they were perfect. Repeat with remaining batches, until all cookies are baked.